SendBlaster is the best software for sending newsletter that provides a complete set of features that allow you to easily manage every aspect of an email marketing campaign. Creating their own graphic templates, list management, sending the newsletter and analyzing campaign statistics have never been easier to manage. SendBlaster is the best bulk email software to manage your mailing lists and set up email marketing campaigns in a few easy steps. SendBlaster combines into one product the practicality of a mass email software with the flexibility of a bulk email web service. On the one hand, you create newsletters and manage lists directly on your desktop: on the other, you get a cloud email tracking service to handle reporting and improve your email campaigns. 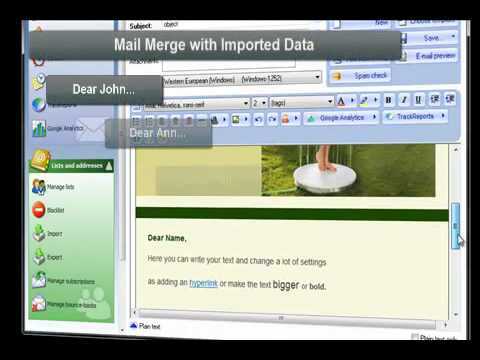 Inserting mailing list management functionalities in your web site becomes extremely easy by the subscription/unsubscription management functions and the abiltity to import data from a web source, letting SendBlaster take care of list updating and mailing the right messages to the right recipients. Save your MS Excel(TM), Access(TM) or Outlook(TM) contact list in .CSV file format, and directly import ALL your customer’s details into SendBlaster. SendBlaster bulk email software works with professional SMTP services and features multiple simultaneous email message sending. The email messages can be imported from external files (HTML pages or previously saved .eml files - for instance, from Outlook). The import functionalities will insert images into the message body, avoiding any external file linking. send personalized messages (“Dear Mr. John Smith”, instead of an anonymous “Dear customer”) Dear #name# -> becomes -> Dear Paul Each mass email is different: using the email merge and email personalization features. Through the direct send mode, if you use several internet connections, you won’t need to modify any parameters to connect to the provider’s SMTP service. You can use the email broadcaster software to send your email with only one click. SendBlaster can manage automatically subscriptions (and unsubscriptions) to build permission based bulk email distribution lists. Each list can be associated with an e-mail address: when a email message with “Subscribe” in the subject line is sent to this e-mail address the sender is added to the list. If the subject is “Unsubscribe” instead, the sender gets deleted (if he/she was previously subscribed). SendBlaster newsletter software downloads new email messages from the POP3 account, verifies the subject and updates the related distribution list. The message CHARSET can be set to send messages with an uncompatible character system (Russian, Japanese). SendBlaster can manage multiple distribution lists. Each mailing email message can contain file attachments (Zip, Doc, Pdf…). You choose the attachment file size according to your SMTP server performances. SendBlaster is the best e-mail marketing software for managing your mailing list.Discover the free solution or the cost effective one, a pay just one time package to easily manage your email marketing using a desktop software. Q. how do I install the software? After downloading the .zip or .rar compressed file, extract sendblaster.msi, which is in Windows Installer format, and double-click it to start the setup process. Q. Can I use Direct Send with AOL? Q. Which settings should I use for Smtp? Q. Can I change Smtp port? Sure; use servername:port format. As an example, if you want to use "smtp.provider.com" on port 579, simply enter smtp.provider.com:579 as your Smtp server address. If no port is specified, default port (25) is used for Smtp connections. Q. Can I change Pop3 port? Q. How can I import addresses from Outlook / Excel? SendBlaster can directly import addresses from Outlook Express; you can import data from other programs (including Outlook, Excel, etc.) after having exported them to .csv/.txt format (one record on each row, fields separated by comma, semicolon or tab) or using specific plug-ins. Q. How can I import data from an existing MySql / SQL Server online database? Simply create a script in any server-side language (Asp, PHP, etc) which will show all your database records in "csv" format (one record on each line, fields separated by comma or semicolon); then, when importing, tell SendBlaster the url of this page. This also applies to any online database, such as postgres, SQL server, etc.